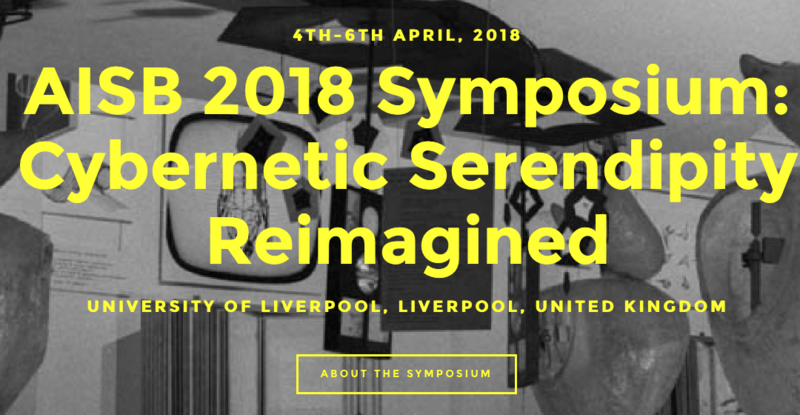 After the very successful Serendipity Symposium in 2018, the computational creativity group is co-organising an exciting, cross-disciplinary workshop entitled „Cybernetic Serendipity Reimagined“ as part of the 2018 AISB Convention. may play in a computational context. science, planning and computational creativity. between these and other disciplines beyond computing. This symposium is part of the AISB 2018 convention. pages. Demos should be accompanied by a 2 page description. Historical material related to the 1968 “Cybernetic Serendipity” exhibition in London, and its artefacts and archives. Discussions of other landmarks and trends in computer art and the culture of computing, with a particular focus on “lessons learned” that can encourage further serendipitous encounters between artists and computer scientists. Serendipity, not limited to themes discussed in the Member Workshop, which included information encountering, social platforms, machine intelligence, robustness and anti-fragility, and intelligent support tools for research. The implications of learning and adaptive systems for AI ethics. Research on innovation, including simulation studies and computational modelling of serendipity, surprise, curiosity, etc., as well as experience reports about innovative system designs implemented using non-computational means. Reports of both successes and interesting failures are welcome. Additional philosophical implications arising from the above topics. beyond the traditions of cybernetic art. get in touch with Joe for specific enquiries.